Interior doors in a building consist of all the doors that do not adjoin to the outside of the building. Home security services can help you choose the right doors for the structure of your home and even provide expert locking systems if you need them in certain areas of the home. Selecting interior doors for security is not a top priority unless you are looking for something with a special purpose such as fire proof doors. When determining what type of interior doors to use, consider which places you want more privacy and areas that don’t need to be private. Also consider security doors like fire proof doors, which you should have on every bedroom in the home. There are basically two types of interior doors. One type is hollow and the other is solid wood. Solid wood doors will be more resistant to sound, so they should be used for the doorways of areas that you want privacy. In terms of security doors, the solid wood doors would be best for areas that you truly need to keep secure. 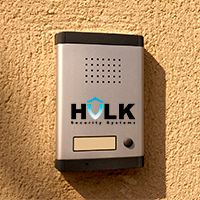 Home security services from Hulk Security Systems will provide you with a free consultation for all of your security needs. Our kind staff members are good listeners and they will be able to advise you about interior doors and safety concerns or advantages with each type of door. Trust the best in the business and be safe. You will need locks on the doors and our expert locksmiths will install secure and safe locking systems for you.